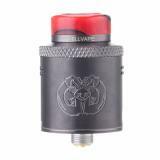 Hellvape Drop Dead RDA has internal barrel lock and deep juice well to bring convenient vaping. Just take it. Hellvape Drop Dead RDA, which comes with deep juice well to ensure easy dripping, is suitable for DIY lovers. In addition, it adopts internal barrel lock for easy removal and adjustable airflow to bring convenient vaping. The tank supports both single or dual-coil building. It contains a regular positive pin and a BF squonk 510 pin. Just take it. • Three-month warranty for Drop Dead RDA. A very good RDA sent by buybest.com. Thanks a lot. Fast delivery and good product. Easy to wick and good flavor. Bundle complete.